After savoring homemade ice-cream at Kow Po Coffee Shop, we headed to Chamang Waterfall. No offense, I must say this is one of the best waterfalls in Malaysia in terms of cleaniness. The waterfall is clean and well maintained. The water is crystal clear and rubbish-free. What I like most about Chamang Waterfall is there is a shallow pool which is very suitable for young children to take a dip and have fun in the water. This is exactly what J and K did. They were having so much fun playing in the water despite the fact that it was the hottest hour of the day: noon. It was not as crowded as I expected. There were two groups of people on the other side of the river – some were having BBQ. A few men were swimming in the waterfall. That’s about all. My wife said it could due to fasting month for the Muslims and the hour which is not suitable for going to the waterfall for the low turnout. Chamang Waterfall is an excellent place to unwind and cool off on a hot day. 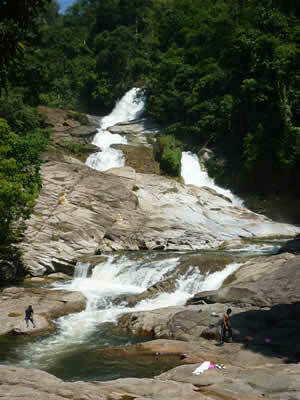 It is easily accessible by car and no torturing hike is required before reaching the waterfall. We like the waterfall so much that we intend to come here for a day trip in the future. We spent quite some time there – maybe about an hour – as we didn’t want to rush our kids while they were enjoying so much fun in the icy cold water. Take a left turn after Bentong town (from Kuala Lumpur). Be careful as the sign board is quite confusing before the left turn. 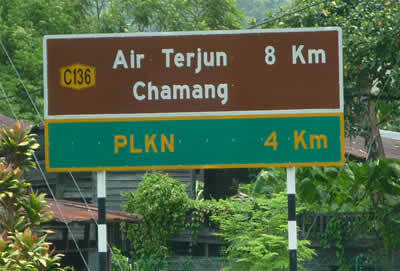 The turning is about 2-3km after Bentong town. From there, drive for 8km along a narrow road and you will see the first car park. Keep driving until the waterfall is seen and you can park the car at the main parking area which is nearer to the waterfall. Toilet facilities are available there. 20 sen per entry. Note: This is the 2nd article of A Family Road Trip to Pahang: Bentong, Raub, and Kuala Lipis series.